1 "Light in a bucket" utilizing a 5 gallon bucket, small solar panel, battery and one LED bulb. These mobile power stations are now used in homes, at water protector camps, and for community gatherings to provide lighting and clean, quiet electricity. 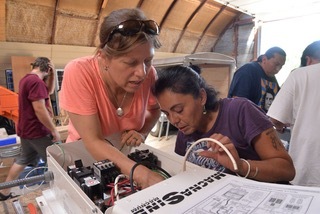 Each system built now provides a teaching aid, traveling between different Native communities, helping to educate about energy produced by the sun.